Serge Etele is a 31-year-old cocoa farmer and native African who lives in Sa'a, a small rural village in Cameroon, on the west coast of Africa. He and his family, as well as a thousand others in his village, were members of a Pentecostal Christian congregation. Today, though, Serge considers himself a Jew. 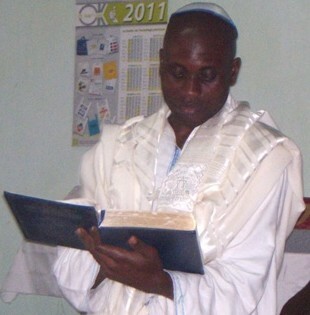 He is the spiritual leader of the Beth Yeshourun Jewish Community of Cameroon. What is most remarkable about Serge's transformation is that at the time of his self-proclaimed conversion he had not heard of any Jews in Cameroon (although there are reports of ancient connections to Judaism), and he never met or had any contact with Jews. How then did this unlikely and puzzling conversion take place 13 years ago when he was still a teenager? In a talk at the 92nd Street Y in New York City on Feb. 23 -- his first excursion out of Cameroon -- Serge told his story in halting but adequate English (French and English are the official national languages of Cameroon, but 230 tribal languages are also spoken). The audience was captivated. After the presentation, I had the privilege of interviewing Serge for more details about his spiritual journey. Serge was chaperoned on his visit to the U.S., which is part of an East Coast tour of speaking engagements with Jewish organizations and student groups, by Rabbi Gerald Sussman and his wife Bonita. Two years ago Kulanu, a Jewish organization that supports isolated and emerging Jewish communities around the world, sent the Sussmans to Cameroon to help Serge and his congregation of 50 self-converted Jews broaden their understanding of Judaism, obtain study materials and prayer books, and establish contact with other Jewish groups. Serge's journey began when he studied the New Testament at his Pentecostal Church in Cameroon, where Christianity is the most popular religion. He said that the deeper he got into his readings the more he could not shake off disturbing contradictions. In particular, his perception that Jesus did not fulfill the Old Testament requirements for the Jewish Messiah -- "Jesus did not bring in the golden Messianic age." The fact the Christians say that the "Second Coming" of Jesus will fulfill biblical messianic prophesies did not sit well with him. Also, he was troubled that Jesus was "not of the Davidic line," another requirement for the Messiah. Although Mary's husband, Joseph, he said, was shown to descend from David in the Gospel of Matthew, Joseph was not Jesus' biological father. Then Serge asked himself: "If Jesus was the dedicated Jew that he is portrayed to be in the New Testament, then to honor his teachings shouldn't I be living the life of a Jew, not the life of Jesus the Messiah, but the life of Jesus the practicing Jew?" Perhaps the most compelling reason for Serge's conversion was revealed in what he said when asked what meaning conversion to Judaism had for him. In his poised, self assured and soulful manner, he said that he couldn't explain it in terms of words or logic but that as he explored Judaism he felt in the depth of his being that he was Jewish. A moment of stunned silence consumed the lecture hall. When Serge, along with several people in his family, and a number of members of the Pentecostal group decided to become Jews, they were at a loss about how to proceed. They didn't have Jewish prayer books nor did they know how to practice. Soon afterwards, though, the world of Judaism opened up to Serge when Internet access came to his area of Cameroon. Although just a high school graduate -- he couldn't afford college -- he had a thirst for learning. He became a regular at a local Internet café where he dived into intense study. He swiftly improved his English, learned Hebrew, and was soon reading the Torah in Hebrew. Serge sought to practice Judaism authentically -- strictly observing the Sabbath, celebrating all the Jewish holidays -- and doing so by following the letter of the law. But how to do that, he wondered, without instruction. Then he thought, what better source than the Torah, since all the Jewish laws come from the holy Old Testament. So, in his group's first celebration of Passover they followed guidelines in Exodus and Deuteronomy and actually slew a lamb, as was practiced in the Temple in Jerusalem prior to its destruction by the Romans in 70 C.E. But he would soon learn about contemporary Jewish practices and services. Aided by the Internet's worldwide access he eagerly sought contact with other Jews for mentoring and guidance on Jewish practices. Much to his frustration, initial efforts to contact rabbis and Jewish organizations were unsuccessful. Virtually none responded. Looking back, he thinks that happened because his inquiries began by identifying himself and his group as Pentecostal converts. The Jews he was reaching out to probably assumed that he was a Messianic Jew who embraced Judaism and Jesus as Messiah. But fortunately, Kulanu was intrigued by Serge's query and responded. Harriet Bograd, President of Kulanu, was impressed by Serge's dedicated pursuit of Judaism. Kulanu became his lifeline to the wide world of Judaism. To give Serge easier access to Jewish communities in the U.S., Kulanu arranged for Serge's formal conversion to Judaism. The ceremony was conducted in New York City by three rabbis. Circumcision, a requirement for Jewish males to fulfill the "covenant," was not a problem. Serge had been circumcised, since it is a common practice among all faiths in Cameroon. Serge sees growing interest in Judaism in his community and expects more to join his congregation. Gerald and Bonita Sussman firmly believe that Serge's growing erudition, infectious sincerity and sense of mission will make him an important voice of Judaism in the coming decades. What are Serge's plans for the future? His primary dream is to intensify his Jewish studies and be ordained as a rabbi. Then, he longs to build a small synagogue and acquire an authentic Torah scroll. Beth Yeshourun currently holds services in the homes of members. Mark Twain quipped, "The reports of my death are greatly exaggerated," after he heard that the New York Journal had published his obituary. Throughout the millennia, Judaism has encountered numerous declarations of its imminent demise. There were persuasive reasons to jump to that conclusion: the Babylonian conquest and enslavement, enslavement in Egypt, the destruction of the Temple in Jerusalem by the Romans along with slaughter, enslavement and banishment, the Nazi genocide, and more have all been proven to be greatly exaggerated forecasts of the end of Judaism. Renewal and revitalization have always resounded -- sometimes in unforeseen ways. Is Serge Etele and Congregation Beth Yeshourun the vanguard of a new and surprising revitalization of Judaism out of Africa?